Plant Enchanted Wins Uptown this August! 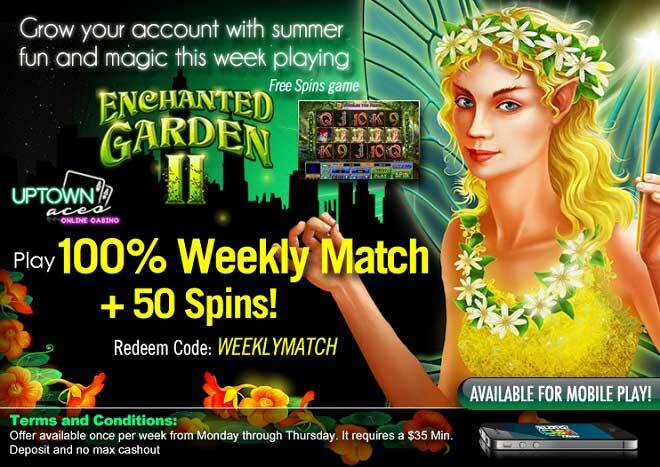 Your summer crop is just getting better and will grow steadily this August the moment you make a weekly $35 deposit to play with a 100% Match and 50 FREE Enchanted Garden II Spins! Wins will be at their peak this summer with Enchanted Garden II and its two spectacular features. The Firefly Feature will have you winning free spins with doubled prizes and the Fairy Queen Feature will give you even more free spins but with prizes tripled! Summer is a perfect season for growing wins - and August has the right temperature for you to make your weekly $35 deposit and grow even more wins with a 100% Match and 50 FREE Spins! Play 100% Weekly Match + 50 Spins!